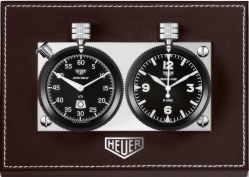 The Ultimate TAG Heuer investors opportunity! The edition re-launch of the historic timing instrument caps TAG Heuer’s year long celebration of a century and a half of motor racing heritage . The timers come with a two year warranty. We understand this to be a very limited edition piece, especially in the UK, so order now to avoid disappointment. In December 2011, TAG Heuer’s Professional Timing Department, maker of the world’s most accurate timekeeping instruments, has reissued one of the Swiss brand’s most legendary products, the famous HEUER RALLY-MASTER dashboard timer. First launched in 1958, the RALLY-MASTER consisted of two side-by-side timing components — the 8-days clock on the left; and a 12-hour stopwatch on the right. It went through several evolutions over the next decades, before being discontinued in the 1980s. The new edition combines an 8-day precision, Swiss-Made, 15 jewel mechanical HEUER MASTER-TIME clock movement with sweeping second hand, and a 1/5-of-a-second HEUER AUTO-RALLY mechanical stopwatch with jumping 12-hour disc. The limited edition re-launch of the historic timing instrument caps TAG Heuer’s yearlong celebration of a century and a half of motor racing heritage. The brand’s - and the world’s - first dashboard timer was the patented TIME OF TRIP in 1911, which saw duty in automobiles, aircraft and boats. In 1933, Heuer introduced the AUTAVIA, a 12-hour chronograph for automobiles and aviation. That same year, it paired the AUTAVIA with the HERVUE, a clock that could run for an astonishing 8 days without being wound. 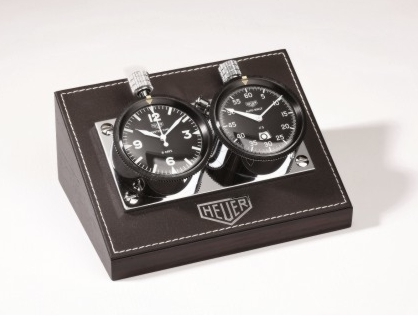 In the early 50’s, Heuer introduced the 60-minute AUTO-RALLY dashboard stopwatch, followed by the HEUER RALLY-MASTER of 1958, a dynamic duo in a class of its own. Its success is immeasurable: in 1959, Jack Heuer himself, while following the Monte Carlo Rally in a press car, noticed that more than two-thirds of the cars were equipped with TAG Heuer instruments. Ruggedly constructed, it became the benchmark for on-board accuracy, and is widely considered the most legible dashboard timers in the history of watchmaking. Through painstaking archival research, the Timing Department located the original designs of the HEUER RALLY-MASTER’s two movements and components. 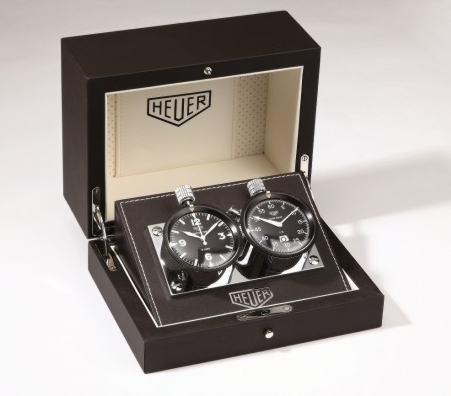 Particularly challenging was sourcing the HEUER MASTER-TIME, a Calibre 28 lever-stop, balance-wheel release clock movement. By working directly with the husband and wife team responsible for the 8-days precision movement’s original construction and assembly — Eric and Dora Montandon of the Swiss company Montandon & Cie — TAG Heuer Timing engineers successfully manufactured a robust new version. This was then paired with the HEUER AUTO-RALLY stopwatch, a complicated movement based on the Heuer Calibre 7780 movement with a unique 0 to 12 hour counter at 6 o’clock, and a crown-operated start/stop and a reset-to-zero function controlled by an oversized, easy-to-use adjacent push button. The vintage timekeeping pair, housed in a stainless steel dashboard double late, is utterly synonymous with the look and spirit of the original. The white hands contrast sharply with the jet-black dial .The crystals are shock-resistant plexiglass. Grade A super-luminova numbers, indexes, hands and pointers on the aluminum turning bezels enhance the retro allure, as do the original HEUER logos stamped on the dials, along with the movements’ respective names and the proud words: “MADE IN SWITZERLAND”. The HEUER RALLY-MASTER will be housed in a special edition presentation case, it is the must-have TAG Heuer piece of this celebratory year, and represents an important moment in watchmaking history.